A great night was had by all at the P&K ‘Quiz for Life’ at the Village Cafe on the 23rd of February. The P&K team had set an ambitious goal of raising $10,000 for Relay for Life, with funds going to The Wairarapa Cancer Society. Over $4,000 had already been raised through sausage sizzles and raffles but it was decided that a quiz night would be a great way of hitting the target. Dustys and Lulu kindly designed a poster, tickets were advertised and within just two weeks all of the 13 quiz tables available were sold out! Originally the plan was to hold the evening at The Martinborough Rugby Club, but due to an unforeseen licensing issue we found ourselves without a venue just 2 weeks out from the Quiz, a huge thank you must go to Bruce and Chris from the Village Cafe who came to our rescue and happily provided their wonderful space at very short notice. David Kershaw, our MC did a great job of ensuring the evening ran smoothly as did Quizmaster Chris (Coggy) Cogdale. 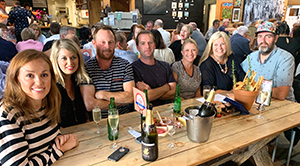 After eight rounds the winning team were ‘Chicken Dinner’ who won the tie breaker question against ‘The Ginger Ninjas’ and scored themselves a $500 meal voucher kindly donated by The Union Square Bistro and Bar. After the quiz, local stock agent Carl Petersen auctioned off various donated artworks, fishing charters, meal vouchers and wine raising over $4,000. Thank you to all of the business’s who generously donated prizes and helped with catering and to those who volunteered their time to help us. We’re happy to report that our goal of raising $10,000 for Relay for Life has been well surpassed, this is truly a reflection of what a wonderfully supportive and generous community Martinborough is.